Are you searching for best Journal Apps on Android ? Then, you have reached at the right place. We have a couple of suggestions which makes your lifelogging more easier and comfortable. Our apps in the list comes with well organised interface, beautiful look and powerful features. Record your everyday life moments in written format. Journal is a fantastic app which saves all your entries along with local weather, location information and you can easily rediscover them at a later time by way of calendar or photo views. It’s easy to use and you can sync the entries to Google Drive or share them to social sites as well. Flava is an addictive, exciting app to capture your unforgettable moments. 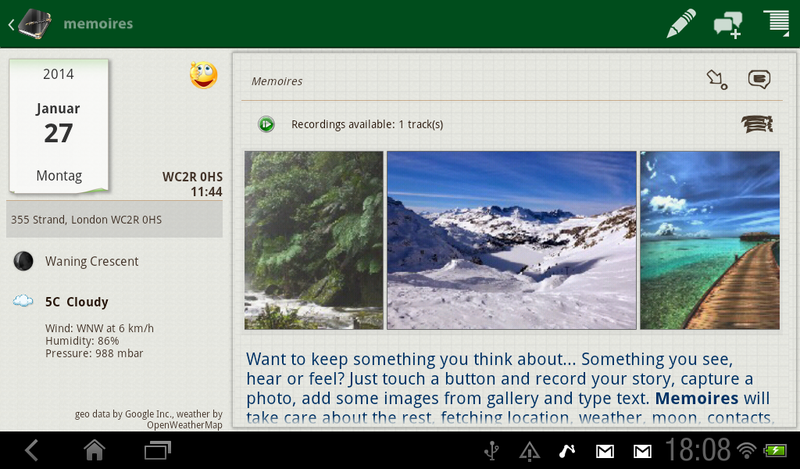 It lets you attach stuffs like photos, videos, music, voice notes, location, books, web link etc to the journal entries. Alternatively you can add categories, text tags and hashtags to the posts to organize them easily. Photo geotagging, Date stamping, Lovely themes and online backup are other major advantages of the app. Diaro is a popular choice in the category. It has elegant design and userfriendly interface optimized for both phones and tablets. The app lets you attach unlimited number of photos along with automatic location detection and many more features. You can customize various options like text size, interface color etc too. The entries can be stored in Dropbox or share them via email, SMS and social networks. Memoires provides easiest way to quickly capture life stories, thoughts and beautify them using photos, audio etc. It tracks your location via GPS and add local weather, place to the notes. Font size and font color can be easily configured. You can attach unlimited number of images to the content and share them across the networks, email or SMS more conveniently. It’s brilliant app to write, save and share your notes. The app can be customized in several ways- by way of appearance, theme, location, tags, auto backup etc. You can search for old entries using range of dates, categories, tags, keywords and send them via email, SMS or Twitter.